This book of writing prompts will kick-start your writing habit and challenge you to schedule your writing for 30 days. It gives you writing briefs to follow until your writing habit is up and running. You’ll also get a link to free video training in finding time to write. If you want to develop your writing skills, or learn to schedule regular writing time, or find out how to establish a writing habit, or if you need few or a whole bunch of writing prompts to get you going, you’re in the right place. The eBook is available for free, so what are you waiting for? Hop over to your favourite ebook platform and grab your copy. 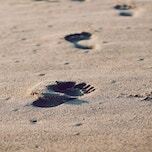 Here’s small steps time management in a nutshell: you can take any task, however daunting, and break it down into smaller and smaller steps until it becomes manageable. You can do small things in your everyday life to help you achieve what you want to. Sound good? 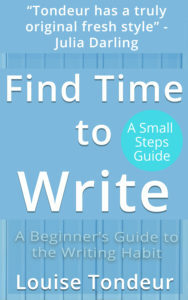 This book applies the small steps approach to the writing life. If you want to write and publish a book, you need to find the time to do it. Using the 30 Day Writing Challenge, and a series of small steps, Find Time to Write shows you how. No-one ever sits down to write a 50,000 or 100,000 word novel or stage play or screenplay or non-fiction book. All writers of long projects do this: they write and redraft 1000 words 50 times (or 100 times). Or they write 500 words 100 times (or 200 times). Could you find the time to write 1000 words sometime this week, or could you write 250 words 4 times this week? If you can, you can finish the first draft of your book or play by this time next year. You don’t need to start with an idea. You need time and space to write, and you need to show up regularly and Find Time to Write will help you to show up.